It’s been almost two years now since this blog was born. We’ve covered a lot of ground in that time as we moved inexorably toward our goal of breaking free from a wage slave existence and departing for our Life On The Hook™. There have been some big days along the way, which of course we’ve documented here. But today is among the biggest. You see, Rhonda got up, got dressed, and went to work this morning for the very last time. 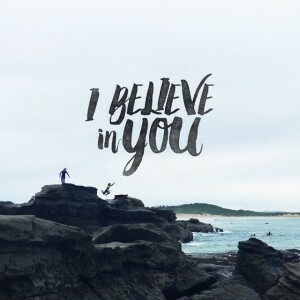 It has been her greatest leap of faith, voluntarily retiring from a well paying professional job for no other reason than that she loves me and believes in me when I say that we’ll be fine in every sense, and that the journey is going to be amazing. And I love her for taking the leap with me. With this last major step, we’re now so close we can taste it. So the last big push now starts. Tomorrow begins a flurry of final preparations. Doctor’s visits to get prescriptions written and vaccinations administered. Getting our vehicles ready to sell. Clearing out all the onboard stuff that we needed for a comfortable life at the pier in order to bring onboard the gear we’ll need once we depart. Updating our will and providing family with guidance regarding how to handle our affairs in our absence. And of course, provisioning for a voyage where we never know when we might encounter the next grocery store or market. This entry was posted in Who?, Why? and tagged Leap of faith, Retiring to go cruising on February 29, 2016 by Robert. If you happened to read our post Protecting What Matters Most, you know I sometimes obsess over little things like staying alive in the event we accidentally fall overboard. 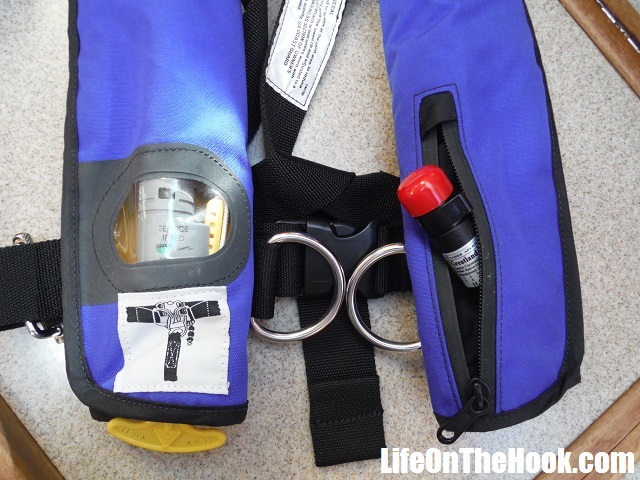 Believing the matter is important enough to merit a belt-and-suspenders approach, I recently added another tool to our “so you’ve fallen overboard, now whatcha gonna do?” kit. They’re signaling devices called rescue lasers, which you use to attract attention if you’re in the water and would really rather be someplace drier. I just assume that if one of us is going to fall overboard, it’s naturally going to be at night. And not just any night, but a pitch dark, the moon has already set and the clouds are blocking the stars kind of night. Having a light with you to attract attention under these conditions would therefore be a pretty good idea. So when I received an email recently advertising a sale for these units, I ordered two. 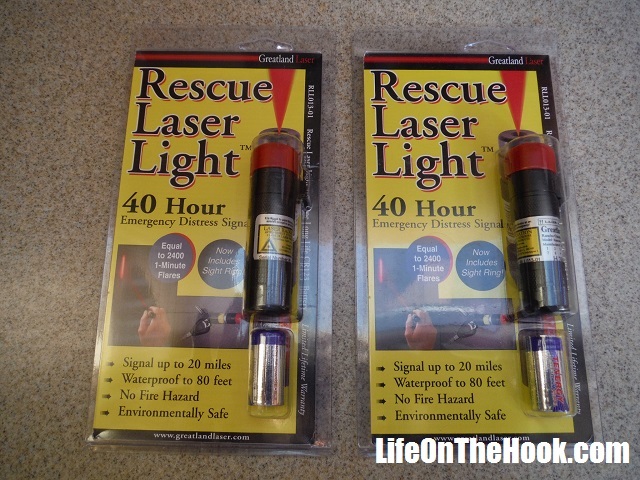 Unlike a flashlight or vest-mounted beacon, you are supposed to be able to reach out and touch someone up to 20 miles away with one of these lasers. So that passing aircraft that you can see five miles above you? Just go ahead and light him up and get his attention. Now I had a self appointed Internet expert tell me in a sailing forum that this would be a really bad idea, because if I shine a laser at an aircraft I might blind the pilots and they will turn around and leave me. But the folks at Greatland Laser, having apparently given a little bit of thought to this issue, designed the unit to emit a fan-shaped beam. This diffuses the laser energy so that it’s eye-safe beyond a dozen feet. And I really don’t see a possible scenario where I’m lasering a rescuer who I can pretty much just reach out and tap on the shoulder. This entry was posted in What? and tagged Greatland rescue light, Life jacket signaling device, Rescue laser on February 26, 2016 by Robert. Everyone went nervously about their preparations, one eye on their boat, evaluating its readiness, the other on the ominously threatening sky. 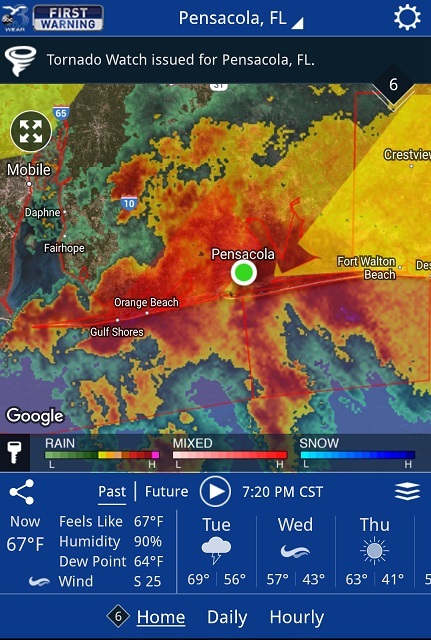 Hail and damaging winds of up to 60 mph with the possibility of tornadoes was the prediction. Just a week earlier a similar storm had wrecked havoc on the town of Century in the northern part of the county, a funnel cloud carving a 16 mile long swath of destruction through the center of town. This storm was predicted to be worse. Was it plausible? Well, it had only been the week before that I had fished another sailor out of the marina waters who had staggered home drunk and fallen in while trying to board his boat. 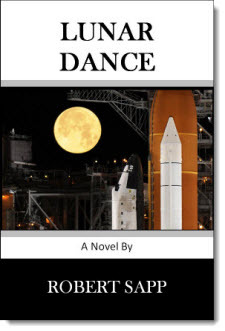 He’d split his chin open when it hit the swim platform of his boat as he went in, and was bleeding so profusely that I called EMS once he was fished from the water and laid out on the pier. If he had knocked himself out (and it’s a miracle he didn’t), then he probably would have drowned. So yes, I think it’s entirely possible. It was now 48 hours since the man failed to arrive at work, and searchers began the grim task of searching the surrounding waters. 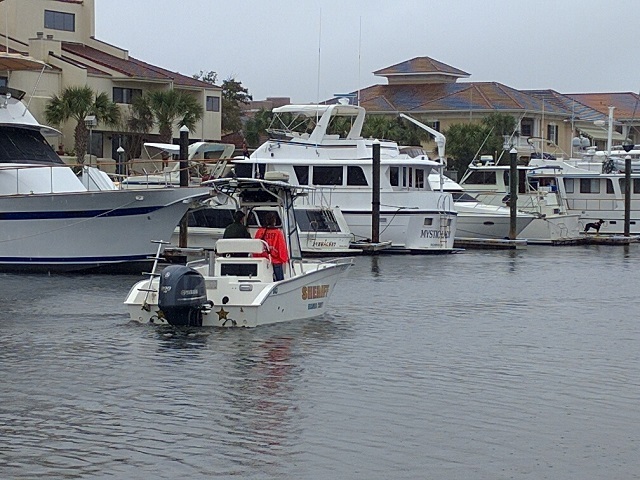 Divers arrived to investigate under the boat, and a cadaver dog was lead through the marina. They searched for hours, while the missing man’s mother stood quietly watching from the patio of the restaurant that overlooks the marina. I don’t imagine I’ll ever again complain about having a bad day after watching what she had to endure, standing for hours in the cold west wind while they searched the marina waters for her son’s body. The storm finally grew too close. The divers were called from the water, and the search boats returned to their slips. Resolution would have to wait for another day. That night a tornado touched down on the northeast side town, just blocks away from the apartments where our youngest son lives. Over 70 homes were severely damaged or destroyed. The good news is that no one lost their lives. To the surprise of some, we rode out the storm onboard. But we had six stout lines securing us tightly to the pier, and other than a great deal of rocking and rolling, we did just fine. This entry was posted in Who? 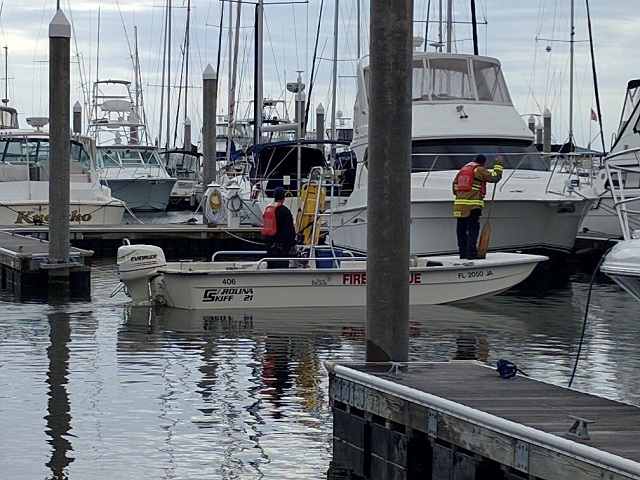 and tagged Missing man at Palafox Pier on February 24, 2016 by Robert. Last Monday at 0900, I turned off the breaker to our onboard battery charger. Since then, our refrigerator and freezer, lights, water, stereo, fans, indeed our entire DC electrical system, has been running solely on solar energy that we’ve captured and stored. In the days between then and now, we’ve seen a mix of sun, clouds and rain. I’ve followed the system’s operation closely. The day’s first trickle of power starts flowing into our battery bank a little before 0730, and the panels don’t shut down and go to sleep until about 5 PM. So far the peak power generation I’ve seen in bright sun at midday is just a touch shy of 20 amps. I designed our solar array to put out over 30 amps, but since it’s only mid-February and the sun is pretty low in the sky (and the panels are often being shadowed by the masts of surrounding boats), I’m confident we’ll get closer to and maybe even exceed our design goal once we head further south. Also, on Monday afternoon a strong front blew through with 40+ knot winds. 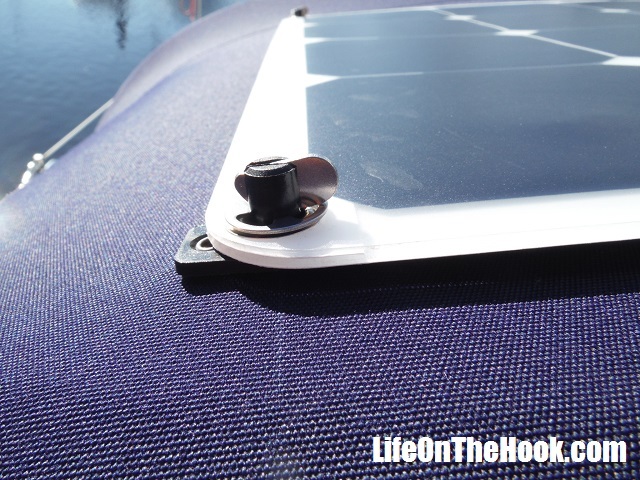 The method we worked out to mount our flexible solar panels to our fabric Bimini survived the gusts with no hint of lifting or flapping. One thing I didn’t sufficiently appreciate though until we actually activated our array is just how sensitive solar panels are to shadowing. 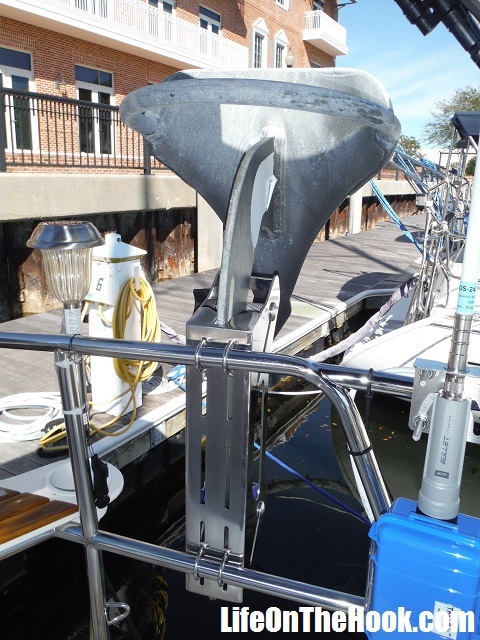 I found that the shadow cast on the panels by the boom could drop the system’s total output by up to 60%. Getting the most out of our system means that in the morning, I have to pull the boom to its starboard-most position to get its shadow off the panels. In early afternoon, it has to be pulled all the way to port as the sun moves west in the sky. So we’ve learned that proper boom (shadow) management is now going to be a part of our daily routine if we want to keep the solar juice flowing and the bank topped off. I’ll soon do another post in our More Power, Scotty! series to give some of the technical details of how we integrated solar charging into our onboard electrical system. This entry was posted in How? 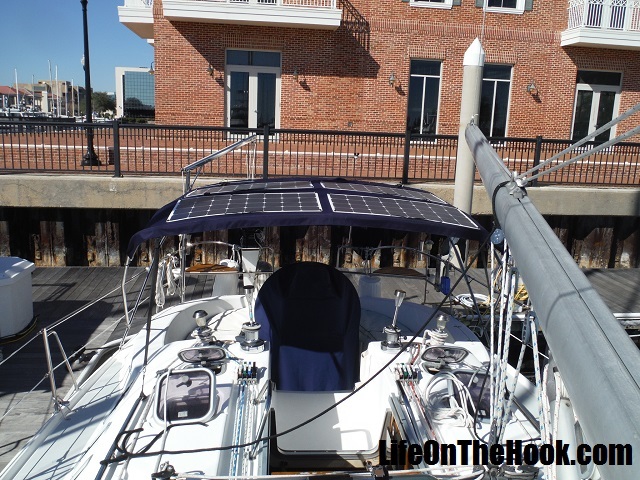 and tagged Flexible solar panels on a sailboat, Hunter 376 improvements, Hunter 376 Solar on February 22, 2016 by Robert. 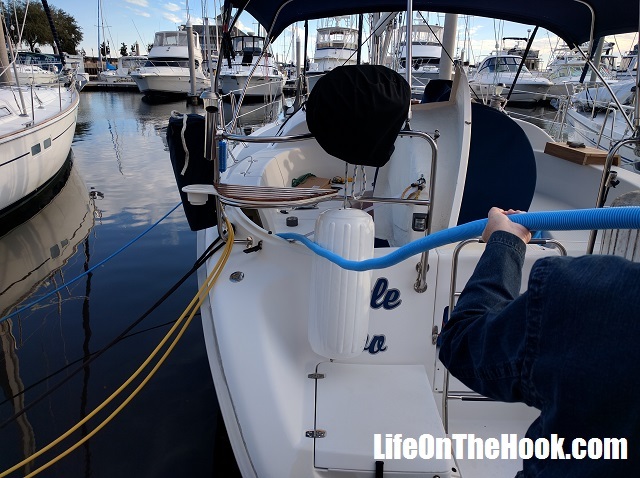 In The Beast Arrives, we posted about our new 55 lb anchor from Mantus Anchors in Kemah, Texas. Once it was hung on the bow roller, we then had the little matter of what to do with our old 35 lb Manson Supreme. Since both anchors are modern spade designs with roll bars, they weren’t going to fit side-by-side on the bow. But the Manson is just too good of an anchor to let go of. After all, the only time it ever let us down was during the 50+ knot winds we encountered in Our Perfect Storm. I had this idea that if I could find a way to store it on the stern pulpit, it might make a great emergency brake if we ever needed to stop the boat in a hurry. As it turns out, the folks at Mantus make what looked like a terrific solution to our dilemma. 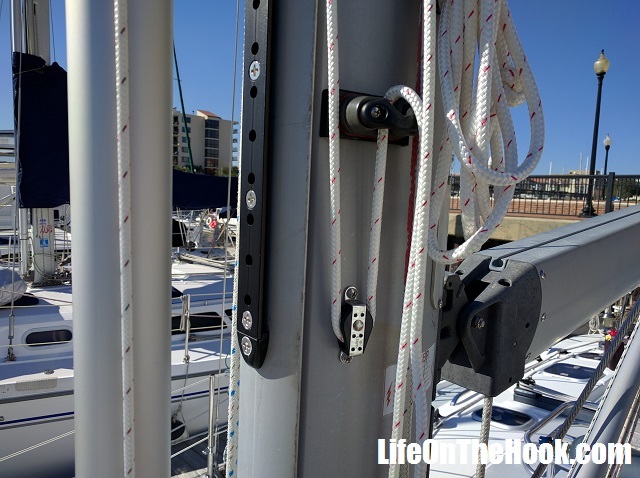 It’s a rail-mounted anchor bracket that holds a wide variety of anchors. But the specs on the unit say that while it can carry up to a 45 lb Mantus or Rocna, it can only hold a 25 lb Manson. Wondering why this would be so since all three anchors are very similar, I called Mantus to ask why. It turns out that the stock on the Manson Supreme is extra tall to incorporate their unique rock slot, and this prevents it from fitting in the bracket properly. But this is where the folks at Mantus stepped up. Rather than just saying, “So sorry, thanks for calling, buh-bye,” they instead offered to grind the bracket so that the internal rollers could be set deeper and allow it to take our Manson anchor. For free. While also giving us a Miami Boat Show discount, when we weren’t even at the show. Sold! 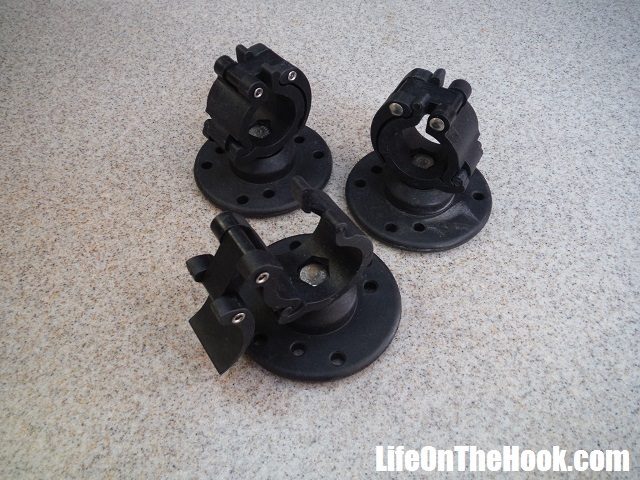 In addition, I had heard about some fancy new rail clamps that Mantus had developed, and I wanted to try some. They looked like they could be really useful as we work out where we’re going to store all the gear we plan to bring onboard prior to departure. So I purchased a pair. 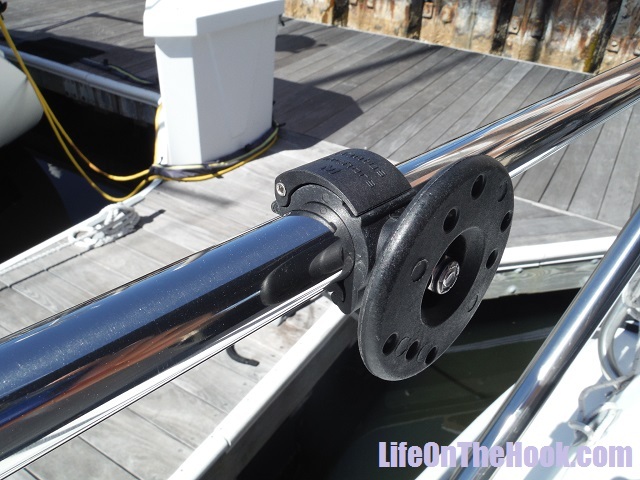 When they arrived, I tested one out, snapping it onto our bimini frame, the new top rail we recently added, and the companionway handholds. But when I tried it on the aluminum cargo rack we had made for our cabin top, I broke the clamp. I could tell that there was some extra resistance when I tried to clamp it, but I forced it, and it snapped. I was really puzzled by this, because everything I tested the clamp on was supposed to be 1″ railing. 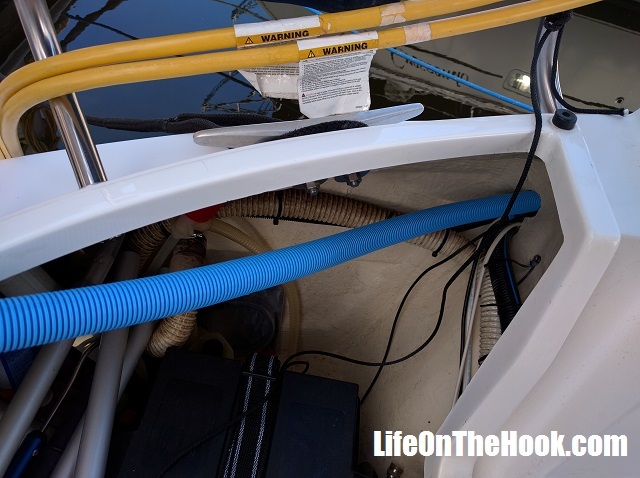 But I pulled out my micrometer and took some measurements, and learned that while the stainless steel bimini frame, top rail and handholds were all 1.000″, the aluminum cargo rack tubing measured 1.04″. This was apparently enough to overload the jaws on the clamp when I tried to close it, as it just wasn’t able to compress that aluminum tube down to 1″. “Oh well, lesson learned,” I thought. I also thought that the folks at Mantus might like to know that their clamps probably aren’t suitable for use on aluminum railing, so I sent them an email describing what had happened, along with a picture of the broken clamp. That’s all, I wasn’t really looking for anything from them. But less than 30 minutes later I received a return mail apologizing for the problem I’d encountered and informing me that they were sending me two more clamps for my trouble! So this is a little shout out to the folks at Mantus Anchors thanking them for their devotion to customer support. A company that tries this hard to earn your business is a pleasure doing business with. This entry was posted in How?, Who? 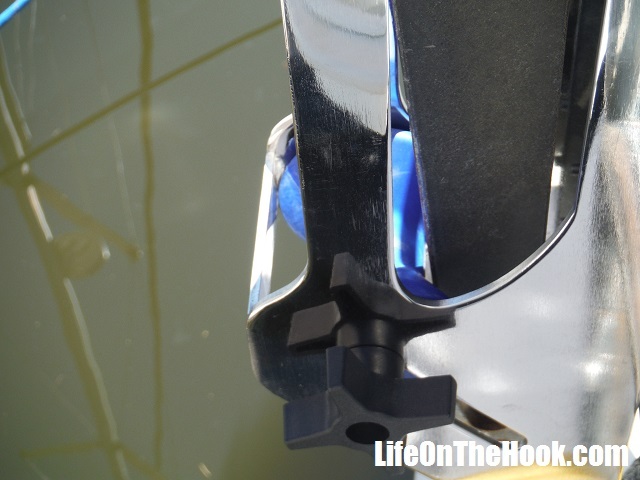 and tagged Mantus anchor bracket, Mantus anchors review on February 18, 2016 by Robert. We’ve had some questions from readers about the details of our whisker pole installation, so I thought I’d provide a few pictures. The first thing you have to decide is whether or not you intend to fly a spinnaker. If so, then you’ll need a much longer and stouter pole than what we’ve used. We have no intention of flying a spinnaker, as I believe that a spinnaker’s purpose on a two-person cruising boat is to turn what would otherwise be a relaxing downwind sail into a terrifying foredeck clusterf&$@. We just wanted to pole out our small 100% jib. As I mentioned in our post Becoming More Gentlemanly, to do that you’ll want a smaller pole than the one Forespar recommends. The 10-18 is the longest that will work. 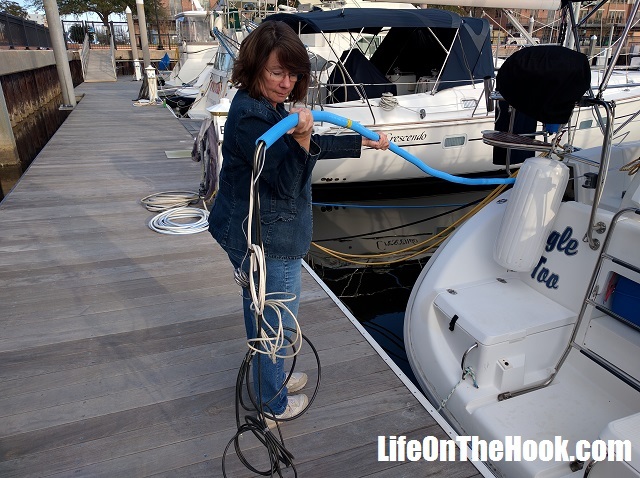 Any longer and it will be very difficult to dip the pole to clear the forestay when changing tacks. Anyone who’s been reading for a while knows that we’re big DIYers. But this was one case where I’m glad we paid for professional support. Our riggers brought their offshore racing experience to bear and installed things in a way different from how I would have done it. But once they explained their reasoning, I’m glad they did it their way. 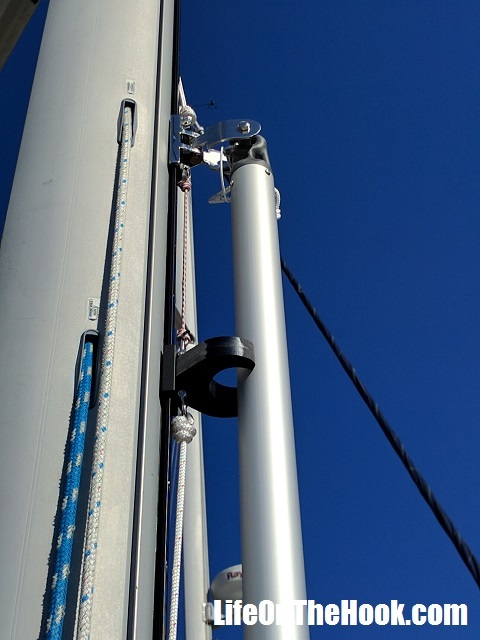 For example, we wanted to store the pole up the mast, and I originally asked them to mount everything on the mast to secure the pole when stored. They recommended we use a deck chock instead. The reason? 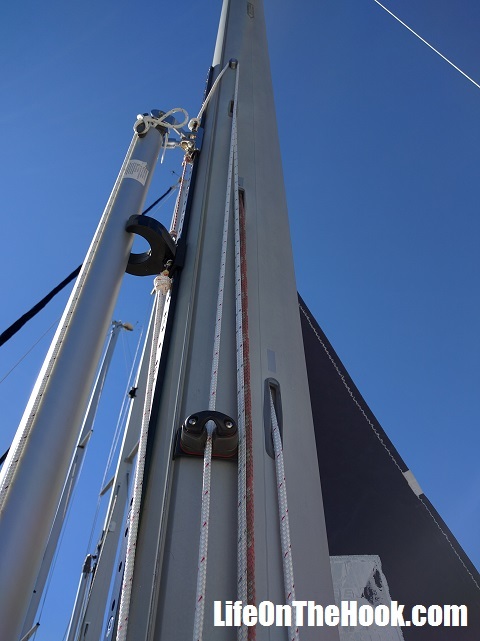 If we suffered a rig failure and lost the mast overboard, the whisker pole would go with it if it was stored on the mast. By clipping one end to a deck chock, there’s a better chance some or all of it will stay onboard for use as an emergency spar. Next, I would have put the cheek blocks for the car control line above and below the T track. They put them off to the side. The reason is so that as the track cars get close to the top or bottom of the T track, the pull becomes more sideways, preventing you from pulling the cars off the track by breaking one of the end caps. I would have never thought of that. The track is an 8 foot section mounted 45″ above the deck. This gives enough room at the top to allow us to raise the pole enough to clear the dinghy, which we usually keep on the foredeck. When the pole is set, it rides right about in the middle of the track. Notice the way the storage car contacts the pole. This looked wrong to me. I expected the pole to snap into the storage chock, which would require some kind of shim behind it to extend its reach. But I contacted Forespar, and they told me that this is how it is supposed to work. I will say that we’ve had several days of winds gusting to near 30 knots, and there hasn’t been a single rattle from this installation. We hope some of you find this useful! This entry was posted in How? and tagged Hunter 376 whisker pole on February 12, 2016 by Robert. Just a quick post to mention that we received a gift in the (e)mail today. When I checked my inbox after having lunch with Rhonda, I saw we had received a message from the US Coast Guard District Seven Response Department. It contained our approved USCG Form 3300 Cuban Territorial Seas Permit! It authorizes a 14 day temporary sojourn to Cuba for crew embarked on S/V Eagle Too to conduct journalistic research, departing Key West on or about 1 May 2016. How cool is that? Disney World? Nah, we’re going to Havana! This entry was posted in When?, Where? and tagged Sailing to Cuba, USCG 3300 Approval on February 11, 2016 by Robert. A year ago this week, I posted Happy Wife, Happy Life, which told the tale of how much better things were onboard the good ship Eagle Too after upgrading our freshwater pump to one with a higher flow. As things turned out, the situation wasn’t quite ideal. It needed just a little…more. 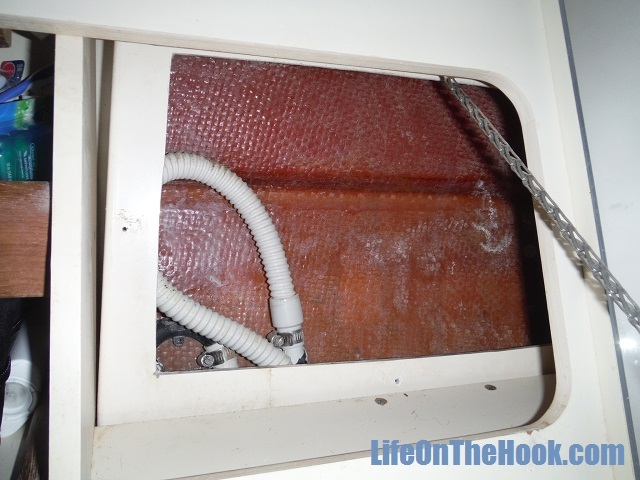 Now some diehard salts will tell you that there’s no need for a pressurized water system on a cruising boat—that it’s wasteful of both power and water, and prone to leaving you stuck without a water source (even if your potable water tank is full) in the event of a pump or electrical system failure. I say to hell with that. Maybe if we were young 20-somethings who wanted to take the aquatic equivalent of a cross-country tour in a pop-up VW camper, we might buy into that view. But that’s not who we are anymore. At this stage in our lives we’re more the nautical version of the set-the-cruise-control-on-the-diesel-pusher-RV crowd. With a spare water pump onboard and carrying seven batteries, I’m pretty confident if something breaks we’ll be able to rig up some kind of work around before succumbing to dehydration. Being able to take a decent shower is just too important to the crew’s morale, and then we have things to consider like all the dive gear we’re carrying, which requires a thorough freshwater rinse after each use. So we see a pressurized water system as a need, not a want. 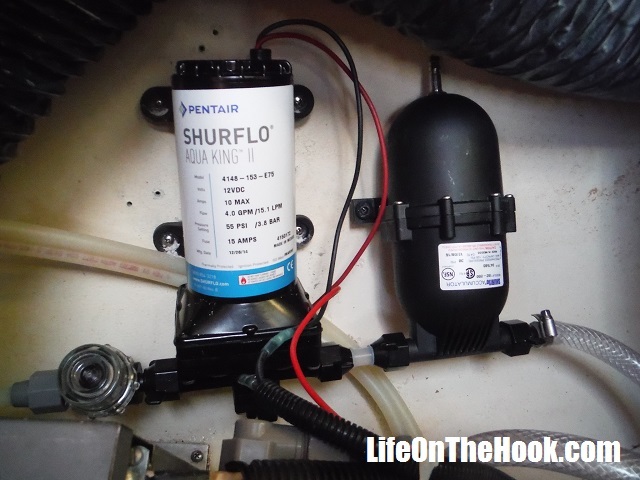 But our poor ShurFlo Aquaking 4.0 GPM pump was taking a lot of abuse. Oh, it could really strut its stuff when we’d fully open a tap to fill a sink or take a nice long shower. But 90% of the time we’re just washing our hands, or rinsing dishes, or brushing our teeth, or some such thing. Something that doesn’t require using more than a moderate trickle of water. Since the pump was the only source of pressure, it would have to rapidly cycle on and off to keep the trickle flowing. Sort of a brrpt-brrpt-brrpt-brrpt thing that was hard on the pump’s pressure switch and internal bypass valve. After a year of that, the brrpt-brrpt-brrpt-brrpt would sometimes continue even after we’d shut the tap. To stop it, we’d have to open a faucet wide for a few moments and then quickly shut it, which was obviously very wasteful. I was pretty sure our answer was an accumulator tank. 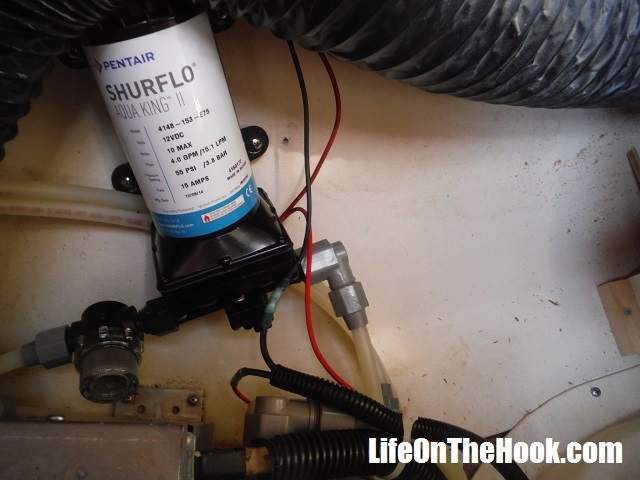 Shurflo makes one specifically for use with their small water pumps. It’s a small sealed tank with an internal diaphragm that contains a bubble of pressurized air. When installed in your water system (somewhere on the discharge side of the pump) it evens out the pressure oscillations and lets the pump start and run without cycling. No more brrpt-brrpt-brrpt-brrpt. Which makes for a much happier pump, which should positively affect its will to live. Installation was straightforward, the hardest part was finding 18 inches of reinforced ½” water line, which is apparently in big demand and short supply. West Marine didn’t have any, Home Depot didn’t have any, and Lowe’s only had two feet left from their 100 foot spool. Driving around looking for a bit of hose to make up the connector I had to fabricate was the longest part of the entire process. But then such is often the way of marine repair tasks. That’s all there was to it. But it made a huge difference in the operation of the water system. We should have done this a year ago! This entry was posted in How? 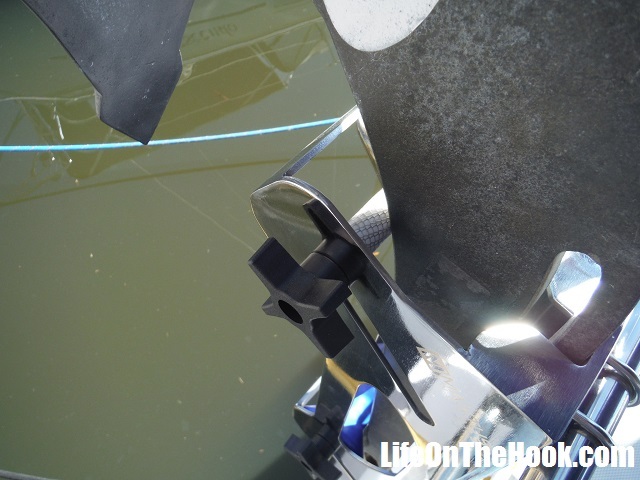 and tagged Adding an accumulator tank, Boat water system accumulator, Hunter 376 improvements on February 10, 2016 by Robert. Today’s subject is pulling wires. This is another article to help you Hunter 376 owners out there. What we’re going to show you could also possibly work on the 380 and 386, which I would guess if you totaled the production run of all three models would be somewhere near a thousand boats. But even if you don’t have one of these boats, this is still a technique that you might be able to use. 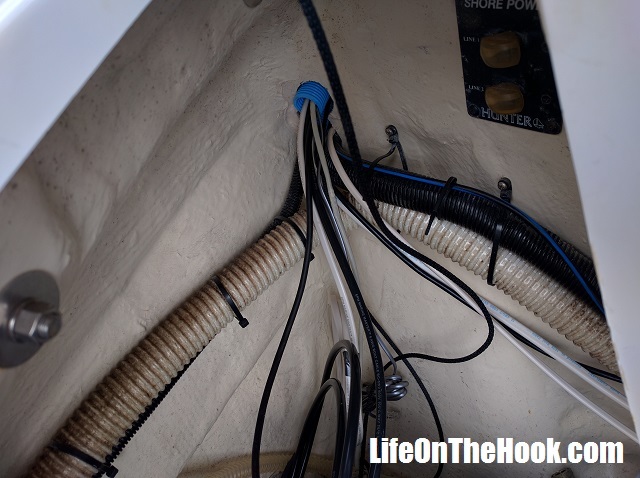 If your boat is lightly optioned, you may have a little room remaining to pull some additional wires from the cockpit to the navigation station through this conduit using the thoughtfully provided messenger line the factory left. But after installing a variety of new gear, ours was stuffed full. About six months ago, I ran my electrical fish tape along this same channel (through the gunwale but outside of the conduit) to run a new messenger line, which I then used to pull some ¾” electrical flex conduit. This gave us a new wire chase to pull a RayNet cable and extend our SeaTalkNG backbone and add some other miscellaneous circuits. Since our departure is now imminent, we’re adding the final gear that we want to have onboard for cruising which we didn’t feel we needed for our year of living at the pier. First up is the extension cable for our Ray60 VHF radio. 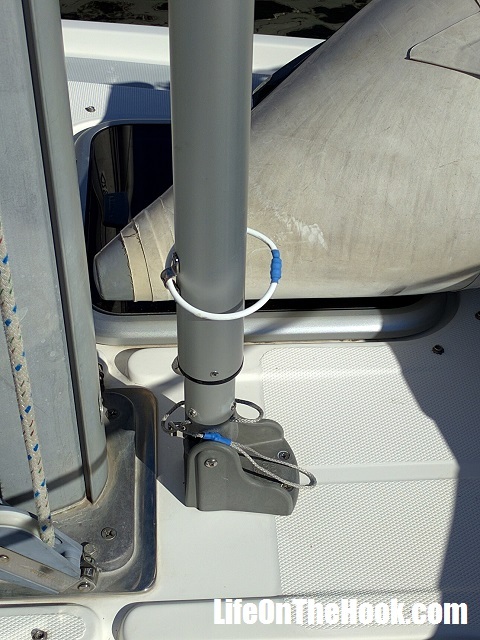 The unit is mounted at the helm, but with the extension cable, we’ll also be able to install a full-function remote at the chart table that will allow us to operate the VHF from below. Unfortunately, the plugs on the ends of the cable are huge, way too big to fit through the remaining available room in the ¾” flex conduit. 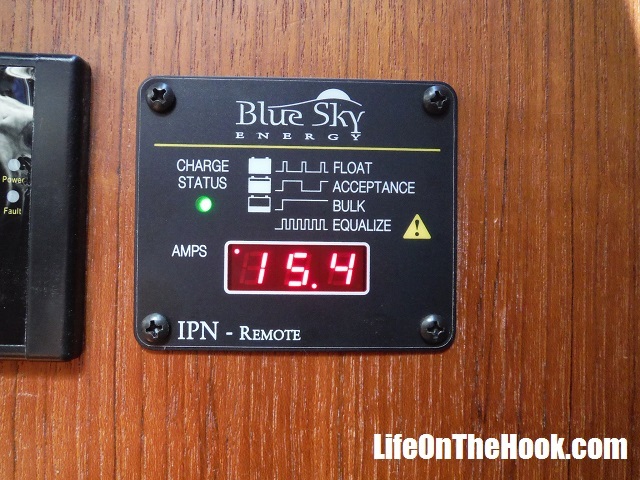 We also want to pull the DC negative cable for our Blue Sky Energy solar panel controller (a 6 gauge wire), the wire for the solar controller remote display, and a power feed to our new rail mounted WiFi amplifier. We’re additionally adding a length of Ethernet cable for possible future use as an extension for the Sony stereo remote that we’re considering installing at the helm so that we don’t have to keep going below to turn down the stereo when we’re in the middle of an anchoring drill and suddenly realize we can’t hear each other over Jimmy Buffett. Now we could have done this job the traditional way, by fishing a line through the channel, using it to pull another length of flex conduit into place, and then feeding each of the wires through it. But then we had this idea—what if we ran the wires through the conduit first, and then ran it through the channel? Could it work? So the first step was to enlarge the opening into the gunwale channel in the port lazarette. I held my breath while I slowly worked a 1¼” hole saw through the partition, and fortunately, I didn’t drill through anything important (of course I probed the area first to make sure there were no hidden wires there). I then finished off the opening with a rat tail file to make room for the new conduit. Here’s a picture that shows the previous piece of ¾” flex conduit I ran and the newly enlarged opening. 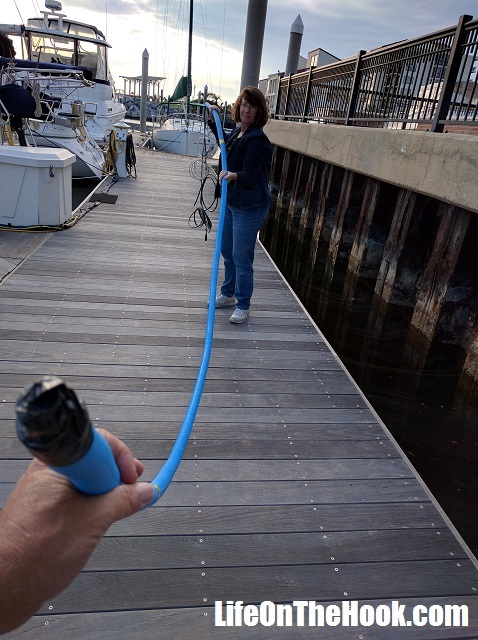 Next we laid the new 1″ conduit section on the pier, fed the wires through, and taped them in place. Now my original plan was to try and use a messenger line to pull this bundle from the chart table aft to the lazarette. But Rhonda said, “Why don’t we go from back to front instead?” And it turned out to be a terrific idea, and proof that it’s always good to have a partner and a second set of eyes to help with projects. While she managed the conduit, I fed it into the opening and pushed it forward. The plastic flex conduit slid easily into place, riding along the top of the existing PVC pipe (you can’t see it, but trust me, it’s there). We were able to push it all the way to the chart table with only a few minor hangups. 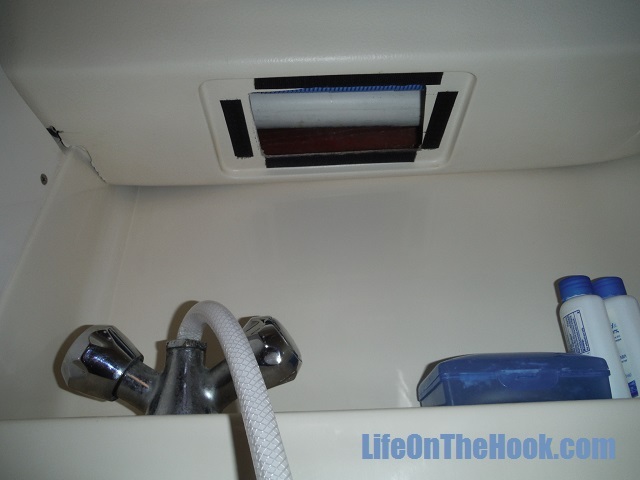 To see where we got hung up, I removed the panels inside the medicine cabinet in the head and above the shower faucet, We could reach up through these two openings and feel the conduit and guide it around whatever it was bumping against. In the access above the shower faucet, you can actually see the PVC conduit I keep referring to. “Magic door? What are you talking about?” I asked. And that was it. We’d already removed the access panel above the chart table, and had no problem finding the end of the newly installed conduit. All we had to do at that point was untape the wiring bundle and pull the wires down into the electrical panel. This entry was posted in How? 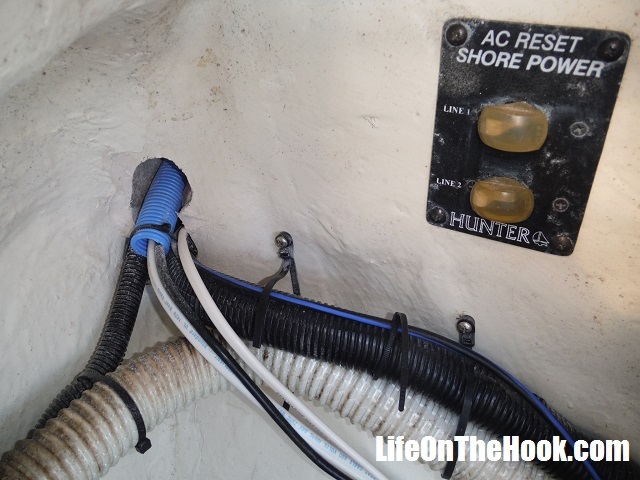 and tagged Hunter 376 wiring conduit, Installing a new wiring chase on a Hunter 376, Pulling wires on a Hunter 376 on February 9, 2016 by Robert. I hate insurance. It’s the most expensive thing a person can purchase that you hope you never have to use. But I will admit that it can help you sleep a little better. Our boat is our home and our most valuable asset, and while we have confidence in our sailing ability and know our skills will only increase with time, accidents do happen. We’ve heard that Cuba has lately been taking a Sargent Schultz¹ attitude to coverage, but many marinas do want to see proof that you at least carry liability insurance before letting you enjoy their facilities. We’ve always carried an agreed value policy from USAA on our boats. The policy is actually from Progressive, but if you call them directly, they’ll tell you that they won’t insure boats as big as ours. It’s because we’re USAA members that we can get the coverage we have. As boat policies go, it’s a pretty good one, with the annual cost of coverage running in the 2% of agreed value range. Anything less than 3% can probably be considered “affordable.” USAA is also known for stellar customer service, which fortunately we’ve never had to test as we’ve never filed a claim on our marine policy. There’s one big showstopper though with our current insurance—we’re only covered for coastal waters within 75 miles of the mainland US. But our plans are quite a bit more far ranging than that. Even travel to the Bahamas would require an additional rider that would push the policy beyond the “good deal” range. The Caribbean isn’t even an option. Some people go without insurance. I mean, how hard would it really be to go pirate and photoshop up some kind of insurance declaration page that you could give to a marina in Mexico or Grenada that makes it look like you’re covered if they asked? It’s not like they’re going to actually call the states to verify the policy (I believe…). Since we own our boat and don’t have to jump through some bank’s hoops, we could go without insurance if we wished. But there’s still that issue about being able to sleep at night, so not carrying insurance on our home isn’t a viable option for us. We knew that before we left for our Life On The Hook™, we were going to have to tackle obtaining coverage. 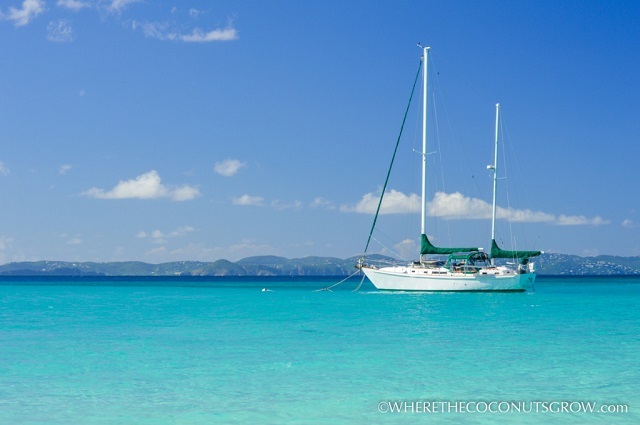 While researching our options we came across a great post on the sailing blog Where The Coconuts Grow that was titled What Marine Insurance Companies Don’t Want You To Know. Among other things, the post included the contact information for an insurance broker in Dunedin, Florida called The Pegasus Group. They offer policies backed by Lloyd’s of London, among others. Intrigued by the prospect of insuring with the same company that covers the Queen Elizabeth II, I gave them a call and asked for a quote. Since this is a post about insurance (yawn), I won’t drag this out. We now have a policy from London International Marine, backed by Lloyd’s of London. It’s an agreed value policy that covers 100% of the replacement cost of our boat in the event of a loss, along with coverage for our tender (dinghy), and the usual liability, medical, and pollution coverage. The deductibles are pretty small, and amazingly the total cost came out to be just about exactly what we were paying Progressive (USAA) for our previous continental-US-only policy We’re covered for the entire Caribbean, Gulf of Mexico and the Bahamas, with the only exclusions being Cuba, Haiti, Venezuela and mainland Columbia. Of course, since we have Cuba in our sights, I asked what a two week Cuba rider would cost. Less than $100, they replied (!). 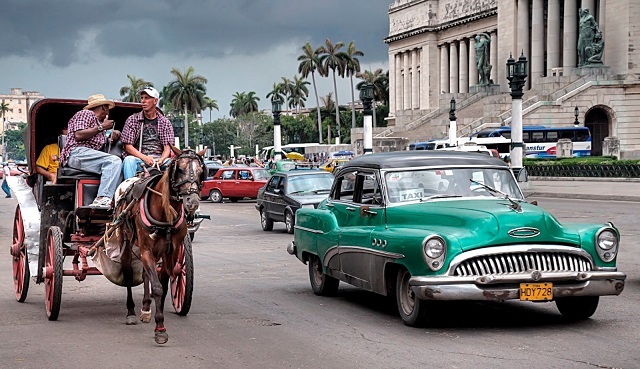 Since LIM and Lloyd’s aren’t US based companies, they can legally write insurance for Cuba. Best of all, there is no hurricane box restriction. None of that “have to be north of here or south of there between June and November or you’re not covered” nonsense. Imagine that—an insurance policy that will actually let us use our judgement on where it’s safe to sail during hurricane season rather than dictating arbitrary requirements! So as I said, I really hate insurance. It feels like you’re betting against yourself, because the only time it benefits you is in the event of a disaster. But we accept it as a necessary evil, and value the peace of mind it provides. And with our newly issued policy, we’ve now checked off another box on our departure checklist! This entry was posted in What?, Why? and tagged How we handled insurance for our cruising boat, Insurance for cruising the Caribbean, Yacht insurance on February 5, 2016 by Robert.